I have made this temari because I wanted to try out a C6 marking for ages. Ok the marking went well but what pattern to choose??? 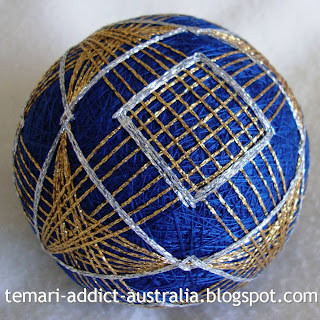 Well I went for one from Debi A's temari math site (see the link on the side bar). BUT it required marking lines in the same colour as the design threads, oh dear that meant I'd have to make another ball or make the design in metallic thread. Well you can see the option I chose. No surprises there. I really like this design (the original one had another set of lines in a diagonal inside the center squares) but I didn't think the metallic could support it... just too slippery. I will give this design another go on a slightly bigger base with cotton thread. Hi Rebecca, I love this pattern!